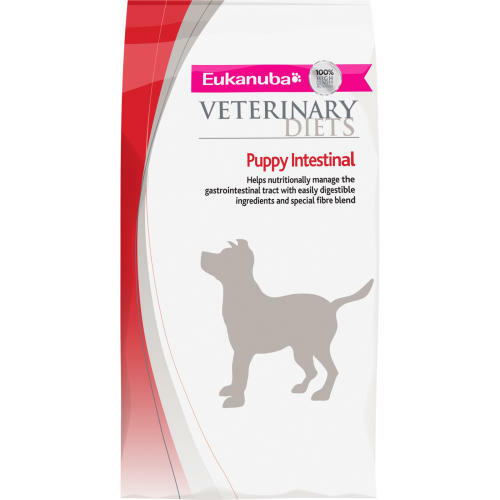 Eukanuba Veterinary Diets Intestinal for puppies is a nutritionally balanced and complete food for dogs with gastro intestinal problems and to aid patient recovery. Suitable for dogs suffering with either acute or chronic gastro enteritis, exocrine pancreatic insufficiency, diarrhoea, pancreatitis, colitis, malabsorption, maldigestion, constipation, or short bowel syndrome, Eukanuba Intestinal Puppy is formulated with beet pulp fibre for digestive health and improved stool quality, FOS prebiotics for increased GI health, and Omega 3 or 6 fatty acids to reduce inflammation. Also suitable for puppies recovering from intestinal surgery, severe parasitism, parvovirus, gastric dilation volvulus, and cancer, Eukanuba Intestinal Puppy contains MOS to help remove harmful bacteria from your pet’s intestinal tract, and is specially low in fat to reduce the strain put on the pancreas. Meanwhile, the crunchy kibbles are rich in antioxidants help to keep teeth strong and clean and fortify your canine companion’s immune system, as well as DHA for improved brain function. Dried Chicken and Turkey, maize grits, animal fat, rice, dried beet pulp (3.9%), chicken digest, dried whole egg, fish meal, fish oil, brewer’s dried yeast, fructooligosaccharides (0.98%), sodium chloride, potassium chloride, linseed, dicalcium phosphate, mannanoligosaccharides (0.14%). Protein 31.0%, Fat Content 20.8%, Omega-6 fatty acids 3.00%, Omega-3 fatty acids 0.65%, DHA 0.1%, Crude Ash 7.20%, Crude Fibres 1.40%, Moisture 8.00%, Calcium 1.25%, Phosphorus 0.90%, Potassium 0.74%, Sodium 0.60%, Vitamin A 12500IU/kg, Vitamin D3 900IU/kg, Vitamin E(a-tocopherol) 200mg/kg, Beet pulp 3.9%, FOS 0.98%, MOS 0.14%.